Join us at the SPUN Kiosk! 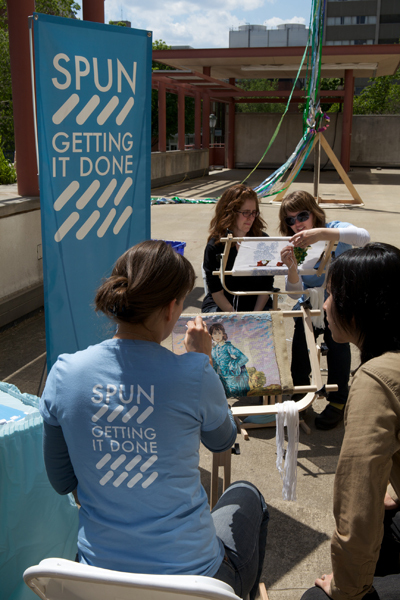 The SPUN Kiosk is bringing unfinished needlepoint to the Craft Alliance for a two-day event celebrating collective effort and “getting things done”. In addition to working on unfinished needlepoint, we are encouraging artists of all kinds to bring in their own unfinished projects and work on them in a supportive environment. Join SPUN founder Mary Smull for this interactive art making experience and help contribute to the ever growing SPUN archive. SPUN Featured in Needlepoint Now Magazine! “Failing to finish a project does not equal failure, Mary stressed. 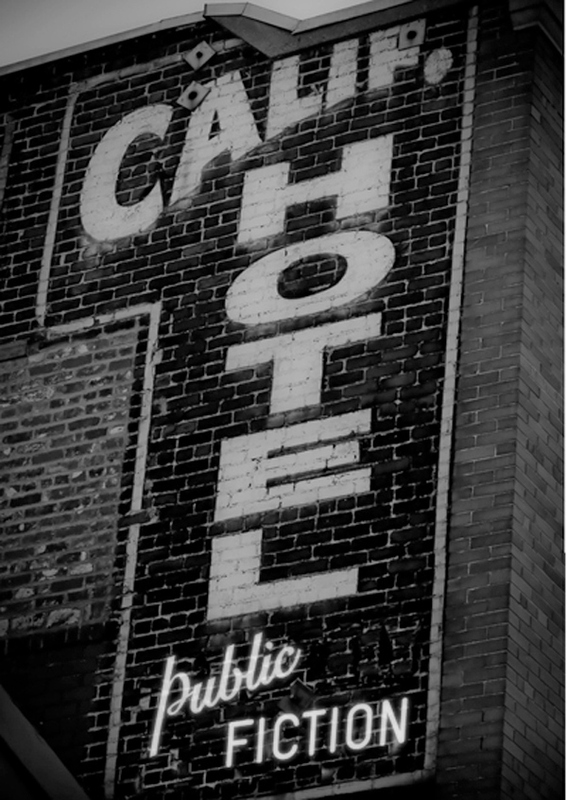 Neither does making mistakes. “Seeing the skill level at ANG [American Needlepoint Guild Seminar], there is no way that you learn that without going through the process of failure. That’s how you figure out how to make great work,” she said. Racine Art Museum, Racine, WI debuts several new works from the SPUN archive from April 18th – September 15th as part of their current exhibition Twenty-First Century Heirlooms, curated by Lena Vigna. Join our founder for a reception and hear her speak about her work as an artist and the roots of SPUN. Do you begin needlepoint projects only to abandon them before finishing? You are not alone. 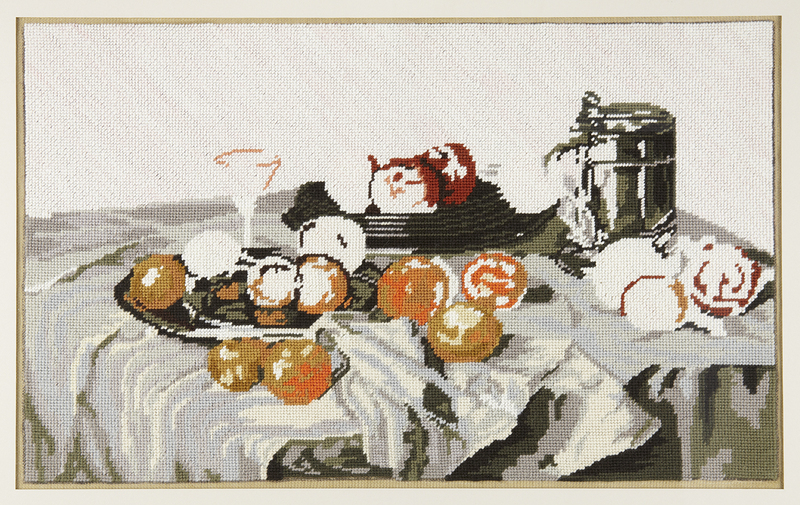 Join Mary Smull in completing a collection of unfinished needlepoint as part of the Society for the Prevention of Unfinished Needlepoint (SPUN). The Society was founded by Smull in 2009 to “eliminate the worldwide phenomenon of unfinished needlepoint” and has been rescuing incomplete works through performances across the country. 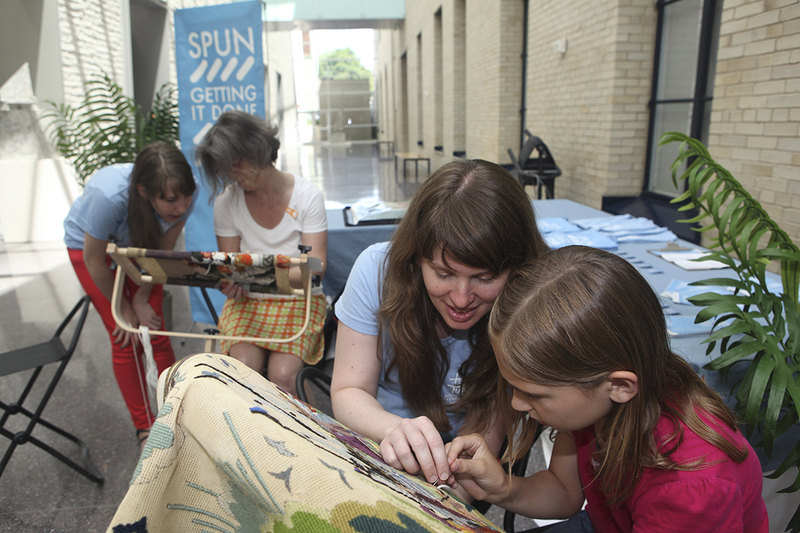 Visitors are invited to participate by completing stitches in unfinished needlepoint projects. Needlepointers of all abilities are welcome, and SPUN volunteers will teach any new-comers to the craft! Once complete, these works will be archived as part of SPUN’s collection. SPUN comes to the Philadelphia Museum Of Art June 23rd, 2012! SPUN, the Society for the Prevention of Unfinished Needlepoint, is the project of Mary Smull, a Philadelphia-based artist and educator fascinated with our culture’s guilt over abandoned craft projects. 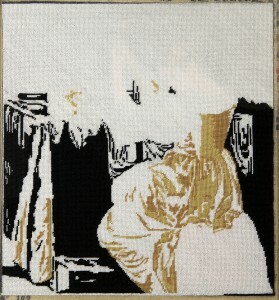 Smull finds and completes unfinished needlepoint, and will lead a needlepoint workshop at the Museum. Drop in and add a few stitches to an unfinished needlepoint or bring your own incomplete projects for inspiration, needlepoint or otherwise! SPUN Founder Mary Smull brings the mission to the Houston Center for Contemporary Craft – Friday, December 2 & Saturday, December 3, 2011! Several pieces from the Finished Works series are featured at the Houston Center for Contemporary Craft as part of the current exhibition Beyond Useful & Beautiful: Rethinking Domestic Craft, on display from October 1 – January 8, 2012. Now our founder brings the SPUN mission to the HCCC audience in person! Do you find yourself filled with anxiety and guilt about incomplete projects around the house? Pulling your hair out about that knitted scarf you started last winter for your sister? If so, HCCC invites you to join visiting needlepoint artist, Mary Smull, for a group therapy session on society’s fetish with finishing projects. Bring your unfinished projects to work on or stories about plans never realized to share in our large gallery on Friday night. Attendees will leave with a lightened conscience about their unfinished works and a deeper understanding of the impetus behind Smull’s Unfinished Needlepoint series. Join SPUN in Getting it Done! Do you begin needlepoint projects only to abandon them before finishing? You are not alone. 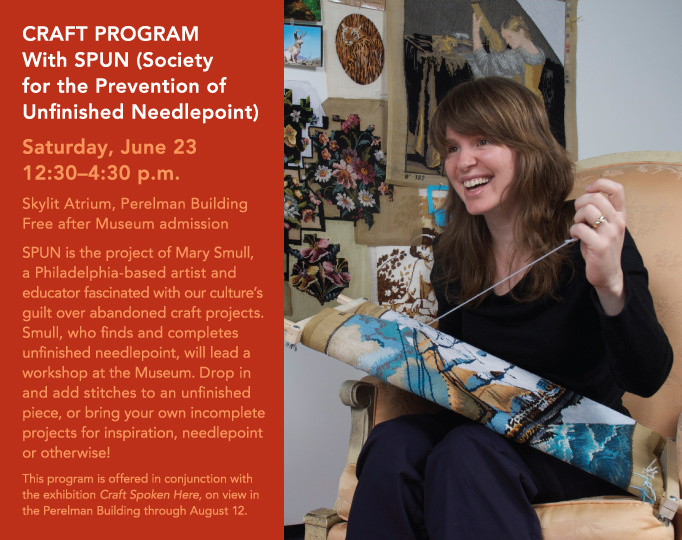 Join Mary Smull in completing a collection of unfinished needlepoint as part of the Society for the Prevention of Unfinished Needlework (SPUN). The Society was founded by Smull in 2009 to “eliminate the worldwide phenomenon of unfinished needlepoint” and has been rescuing incomplete works through performances across the country. 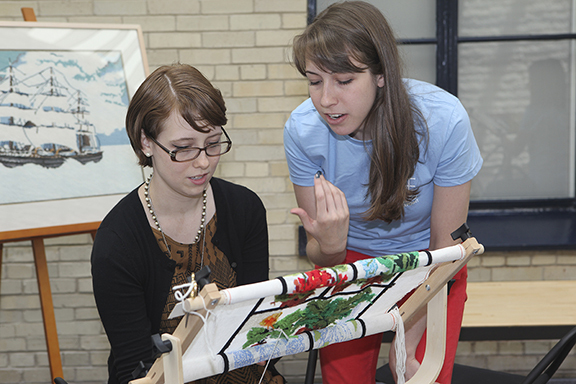 Visitors are invited to participate by completing stitches in unfinished needlepoint projects. Needlepointers of all abilities are welcome! Once complete, these works will be archived as part of SPUN’s collection. The Society for the Prevention of Unfinished Needlepoint kiosk will be featured this weekend at Los Angeles’ Public Fiction gallery as part of The California Hotel exhibition! Join us for the show’s Black Sunday event, Sunday November 27th, from 12PM – 4PM. 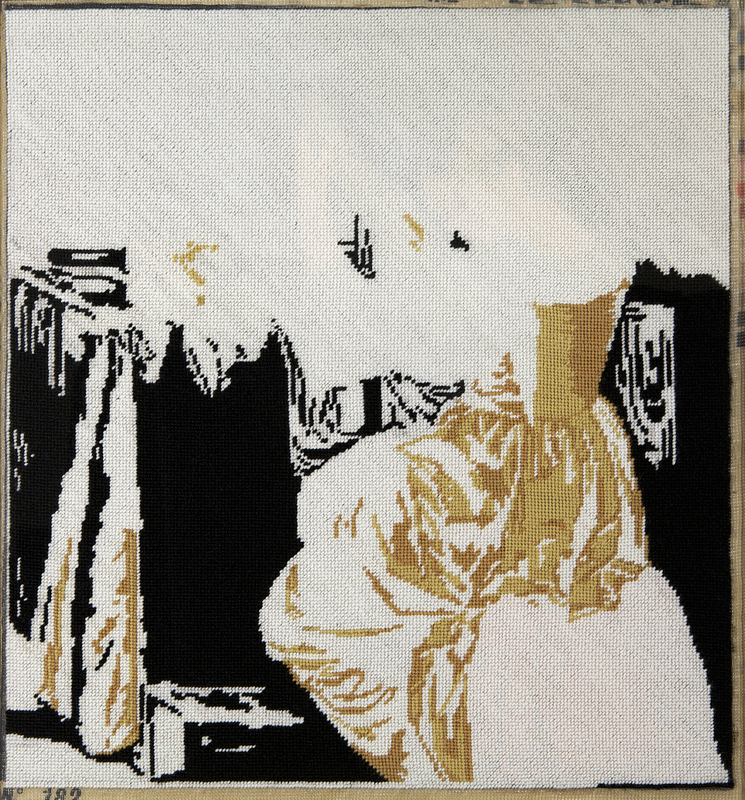 Come out to advance the mission to complete unfinished needlepoint – and view other work by representatives of Philadelphia-based art collective Grizzly Grizzly. 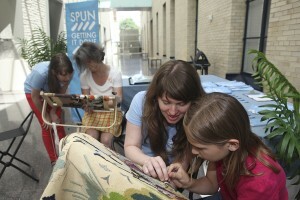 On Saturday May 7th, the SPUN kiosk debuted at the Institute for Contemporary Art, Philadelphia, PA! New members joined the Society and the public pitched in, stitching white yarn on a few of the many unfinished needlepoint projects SPUN has in its archive. Much of our help at the kiosk came from people learning how to needlepoint for the first time, instructed by our founder and SPUN member volunteers. Visit the SPUN kiosk on Saturday May 7th, 11AM – 4PM at the Institute for Contemporary Art, Philadelphia, PA as part of the Interlace: Weaving Community event, curated by Kelly Cobb.